Today is the 5th of November. For the Americans, that date will have little significance, and indeed, for many people in the UK, it is of little significance other than that some folks have bonfires, and that the buying of fireworks empties many wallets. The November 5th bonfire and the burning of a 'Guy' relate to events that occurred in London in 1605. The morning of our bonfire: the sun was shining and it was a perfect November morning. As the day goes on, and the bonfire is set up - with the centre pole firmly set, and Guy's seating arrangement sorted - work progresses to making the Guy. This photo was taken before 4.30pm and the sun is setting. I guess we're kinda far north right enough, but I can't get over how quickly time passes. It seems only weeks since we were going to bed at night and the sun still hadn't set. The Builder does some quick CPR, but it's all to no avail. Sorry, Guy, but this is to be your fate. You don't attempt to blow up our Parliament and think you're gonna get off with it. And then it's time for some fireworks. 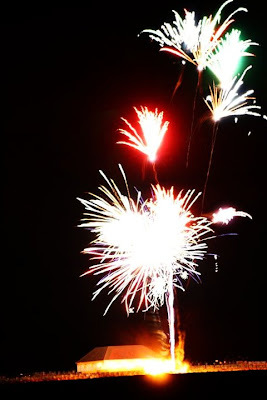 I wasn't able to get good photos of the fireworks at all, but this photo of our fireworks, with our house in the background, was posted on the Eoropaidh Tearoom site. This gives a better flavour of what we had. I love fireworks night! We've seen quite a few displays this year. What a large bonfire you had! Guy Fawkes has been marking the years these last several years.... I am always amazed that another year has gone buy and it is time for Bonfires again. I love your bonfire celebration. It looks like such fun; a little like our 4th of July. I know how the kids and especially the boys love to build a big fire, and set off fireworks... all joy haha. Love the pictures, you always make me laugh.